Svartifoss is one of the most unique and amazing waterfalls in the country of Iceland. The name means ‘black falls’ and it comes from the dark lava basalt columns surrounding the waterfall that look kind of like organ pipes. The basalt columns are similar to the ones you can see at places like the Giant’s Causeway in Ireland, or the Devil’s Tower in Wyoming, USA. 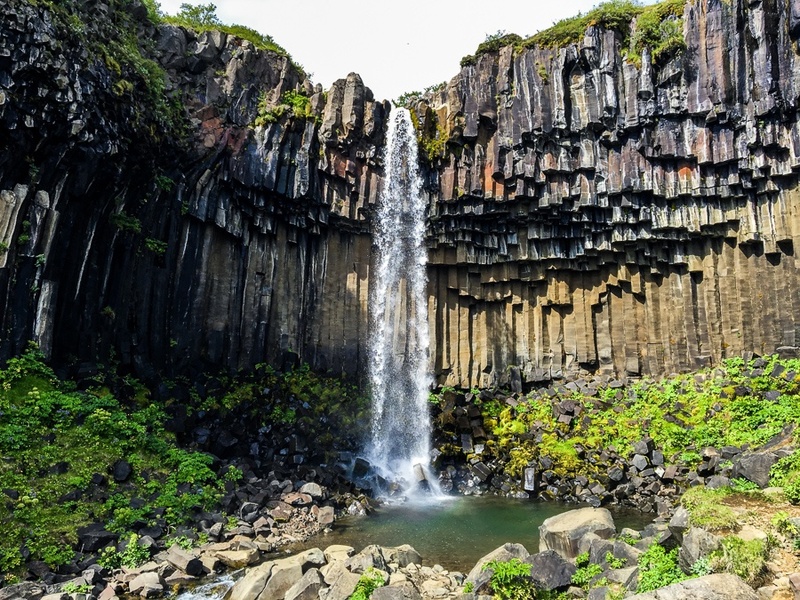 But the combination of basalt columns with a waterfall is especially cool, and the only other place I can think of where you could see something similar (outside of Iceland) is Abiqua Falls in Oregon, USA. Svartifoss may look small in photos, but it’s actually about 65 feet tall! Another cool fact is that the rock columns here were an inspiration for the architectural design of Hallgrímskirkja Church, one of the well known landmarks in Reykjavik. Maybe it’s just me, but the rock columns also remind me of the patterns you see on Icelandic sweaters. The waterfall and rock columns can’t be seen from the parking area at Skaftafell, but the hike to the falls is pretty straightforward and only takes about 30-45 minutes. I’d rate it as a pretty easy 1 mile (1.5 km) one way hike, but there is a bit of elevation gain (about 400 feet). After you reach the falls, you can just return the way you came, or else you can continue past the bridge at Svartifoss and this will take you on a loop hike that includes a few other small waterfalls; these are not as impressive, but you might as well pay them a quick visit on the way back! From Reykjavik, drive east along the Ring Road (Route 1) until you reach Skaftafell, in the Vatnojokull National Park. From the parking lot, it’s a 30-45 minute hike to the waterfall. Svartifoss is about 200 miles (330 km) from Reykjavik. There’s a fee of 750 ISK ($6 USD) required to park here and visit the waterfall.